I’m not particularly tall; I’m not particularly wide; but still, I absolutely cannot get comfortable while on an airplane. There’s something about the small, rigid seats and the recirculated air that makes it nearly impossible for me to settle in on a plane, let alone get some shut-eye. 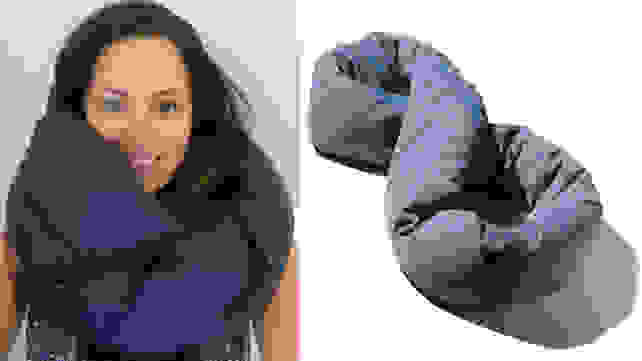 For years, in desperate attempt to sleep at 40,000 feet, I tried variations on the standard neck pillow—you know, the U-shaped one they sell at nearly every kiosk in the terminal. I tried inflatable neck pillows, I tried memory foam neck pillows, I even tried bringing my own bed pillow from home. No matter what, I’d arrive at my destination bleary-eyed and desperate to dive into bed. 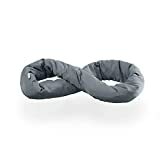 But then I received the Huzi Infinity Pillow ($40) as a gift from a friend who called it a game-changer for lengthy airplane rides and car trips: and a game-changer it was. This pillow has an infinity design, so there is support at every angle. It’s essentially one big loop—like a long skinny body pillow that’s sewn together at both ends. The first time I used it, I was on a six-hour flight from NYC to Los Angeles. I—the woman who absolutely cannot sleep on planes—wrapped that soft pillow around my neck, leaned over to the side, and fell asleep before we even took off: I never even reclined my chair. I woke up to the wheels hitting the ground in California. That day was totally disorienting—because I had actually slept the whole flight. I spent the day bright-eyed, but wondering, how did I get here?! Did I teleport? It was glorious, and I knew right then and there that I’d never take another trip without my trusty new neck pillow. My main problem with traditional neck pillows was always the fact that, despite my best efforts, my head would inevitably fall forward. And if that motion didn’t immediately wake me up, I’d wake up a few minutes later with a sore neck. The supportive infinity design on this pillow eliminates that problem. I wrap the pillow around my neck twice to create a sort of cocoon around my head that prevents it from bobbing, yet isn't restrictive. 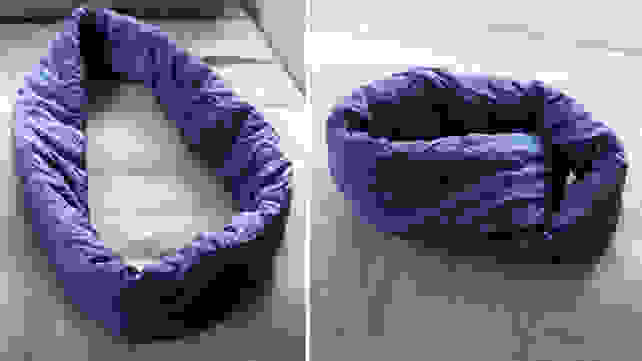 The flexible design also makes it possible to fold it into a traditional pillow, finagle it into a sleep mask, or prop it up as a back cushion. It’s about three feet long, so you can even wrap it around your entire body to cushion both your neck and your back at the same time. The filling is super soft and plush—it feels like you’re resting your head on a down pillow. Plus, the high-quality bamboo fabric is very soft and silky to the touch. It’s also machine-washable, hypoallergenic, and anti-bacterial, which is great for germy planes. 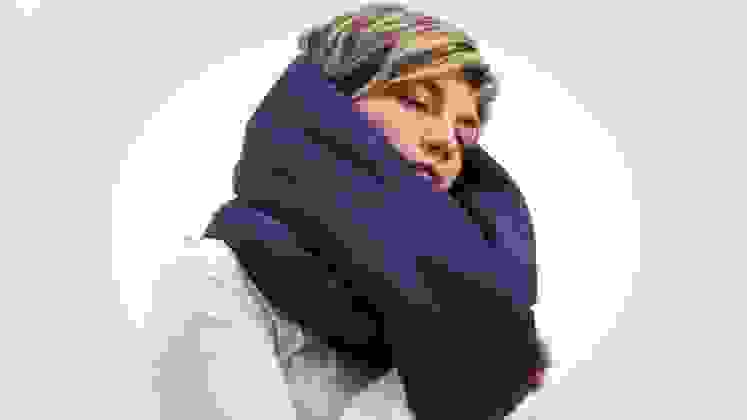 One of the best things about this comfortable neck pillow is that it offers more support than some similarly designed scarf neck pillows, yet it doesn’t look ridiculous (I’m looking at you, Ostrich pillow). And although it’s technically pretty big, it’s squishy enough to stuff into an already jam-packed carry-on. I’ve done so many times without issue. Yes, the Huzi neck pillow is more expensive than some of the cheap pillows you’ll find at drugstores (you know, the ones you can never seem to fall asleep with?). But the price of the Huzi is comparable to any highly-recommended neck pillow—in fact, it’s cheaper than some other fan favorites on the market (looking at you again, Ostrich pillow!). These days, I don’t get much sleep on planes. Not because of comfort, but because I have an infant in tow. On a recent overnight flight to Norway, though, that same neck pillow helped me squeeze in a few hours of sleep once my son went down. And actually getting some sleep on a trans-continental flight, even when you’re traveling with a baby? That’s priceless.